WASHINGTON — Even though Wayne Rooney wasn’t in from the start, the English national team’s all-time leading scorer was instrumental in finishing things off in D.C. United’s first true home game of the season. 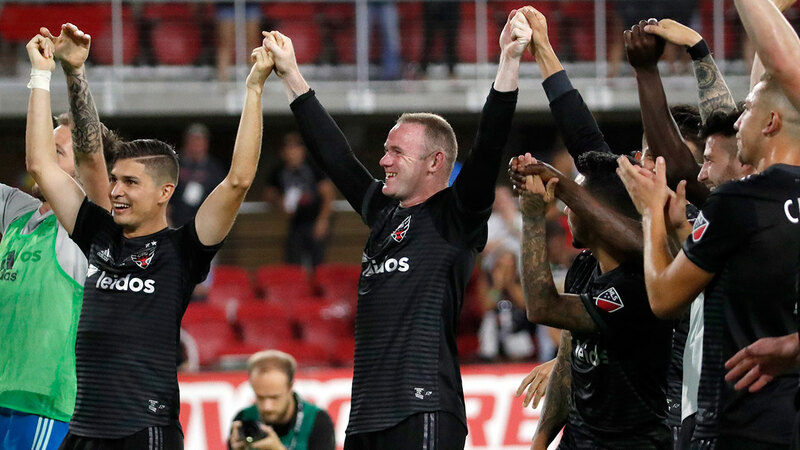 Rooney made his Major League Soccer debut Saturday as a second-half substitute and assisted on the third goal in D.C. United’s 3-1 victory over the Vancouver Whitecaps in the first game played at Audi Field. "Once Wayne came on I thought things really changed for the better," D.C. United coach Ben Olsen said. Rooney, who entered the game in the 58th minute with D.C. United leading 1-0, provided the assist on Paul Arriola’s second goal of the game in the 80th minute with a simple square pass 30 yards from the goal. Earlier Rooney was involved in the buildup to United’s second goal in the 69th minute, also from Arriola. "It’s a big night — my debut in MLS, my debut for D.C. United and a win so I’m delighted," Rooney said. The 32-year-old Rooney, who is also Manchester United’s all-time leading scorer, last played a competitive game on April 28 for his boyhood team Everton in the Premier League. Rooney felt good after playing just a bit more than 30 minutes and hopes to increase his time on the field as he regains his form. "Another tough week of training now and hopefully I can get a bit more game time next week," Rooney said. Fans in the sellout crowd of 20,504 — many decked out in Rooney jerseys from his time in England as well as those wearing his new shirt with D.C. United — began chanting ‘We Want Rooney’ as he warmed up with the other substitutes in the 50th minute near United’s endline. Eight minutes later the crowd went wild as Rooney checked in for Darren Mattocks. After having two shots blocked in his first five minutes in the game, Rooney’s best chance to register a goal in his first MLS appearance came in the 79th minute but his near post header from eight yards out was saved by Whitecaps goalie Brian Rowe. Rooney again had a dangerous attempt in the 88th minute but his volley attempt went sailing over the crossbar. Rooney, a veteran of three World Cups, said he went about his normal routine in despite the attention focused on his first game in MLS as well as the opening of D.C. United’s brand new stadium in Southwest Washington just a few blocks from Nationals Park. "I’ve made a few debuts over my career and today was no different than the other ones," Rooney said before giving a detailed account of his pregame activities. "I got up, had breakfast, watched the England game in bed, went for a walk, had lunch, had a sleep, and got ready for the game so exactly the same as I would any other game."